Toyota UK aired the new 2012 Yaris commercial on the 26th August. 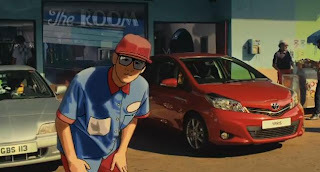 The concept of the commercial is to outsmart life, so on the left, we have the 'Gadget Guy', who has a pasta-shredder and many plug-in gadgets in his Honda Civic, while on the right, we have a young woman in the Yaris. Gadget Guy is then asked a question by an animated dancer, which then shows the woman connecting her phone to the vehicle's multimedia system. One thing you may notice about the ad is the GTA San Andreas feel and sound to it. Check it out after the break!